I don't know about you, but this weekend wasn't nearly as long as I would have liked it to be. I promised myself two days of rest and relaxation, but there's just something about Saturday morning around 10:15 AM when I feel an urgent need to quit lounging around and start being productive. If you follow me on instagram, you know that I somehow caught the bug to update my bedroom walls. 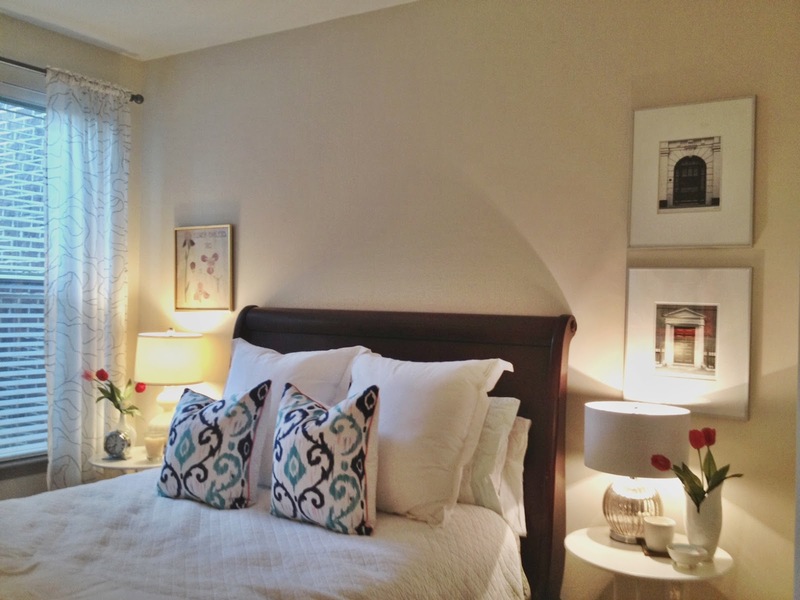 I LOVE this room but feel like the walls need more. The two framed black and white photos of doors are actually Ikea finds. The Iris watercolor was done by my great grandmother, Myra Catherine Sharpe Martin (I think her name is gorgeous, by the way-watch out future daughters of mine). When we hung these pieces months ago, I didn't want the symmetric look, but now I'm realizing that its just not cutting the mustard, so to speak. 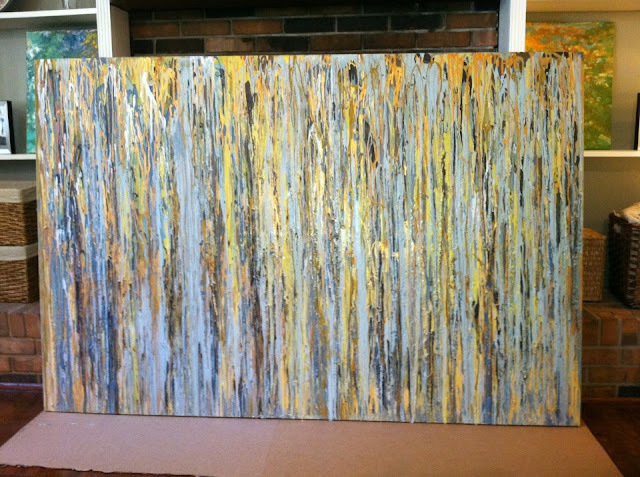 One of my good friends from high school does some of the most incredible work (see below) and contacted me to tell me she wants to do a piece for me. Typically, her paintings are very colorful, but I'm leaning on more of a neutral color palette, because I will clearly change out the decorative pillows at some point when I get tired of them. Her name is Lee Jackson and she is the sweetest most talented girl you'll meet. What colors would you suggest? Am I crazy for wanting to commission her to do something in the cream, white, tan, pale pink, muted gold family? Another Instagram shot. 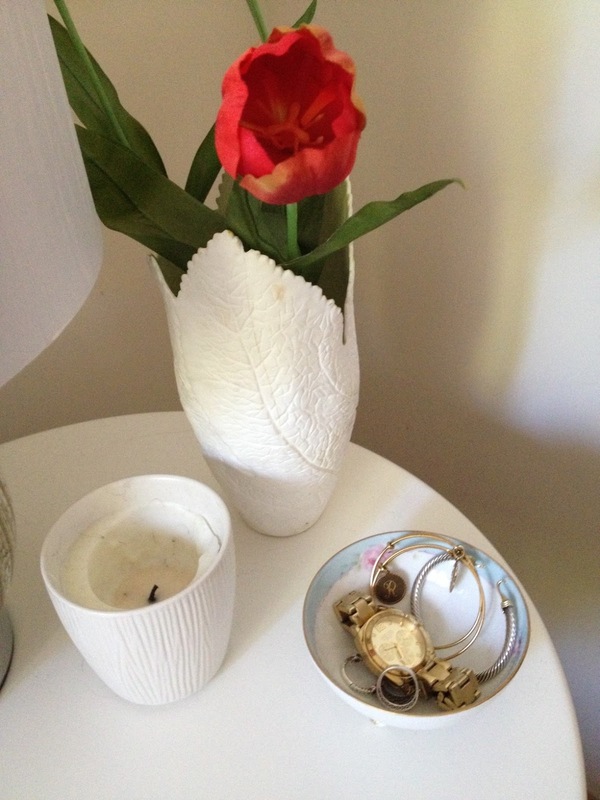 You can always find my jewelry stashed away in a little bowl like this. The MOMENT I walk in the door, those suckers are coming off! 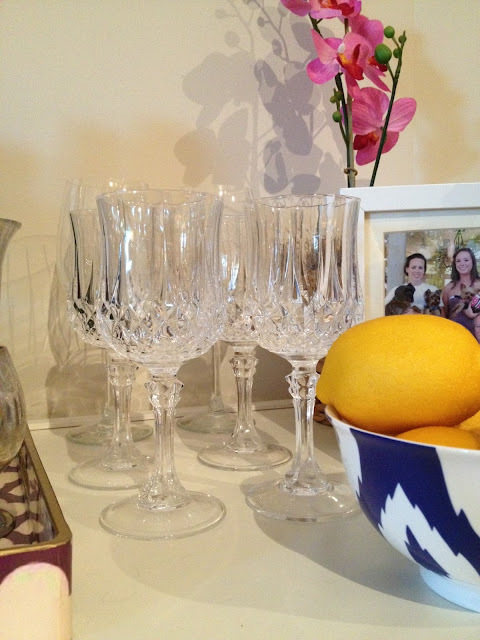 I love little vintage finds like this that add just a tiny bit of extra character to a table. I made a Target trip and promised myself that I would stay on track. 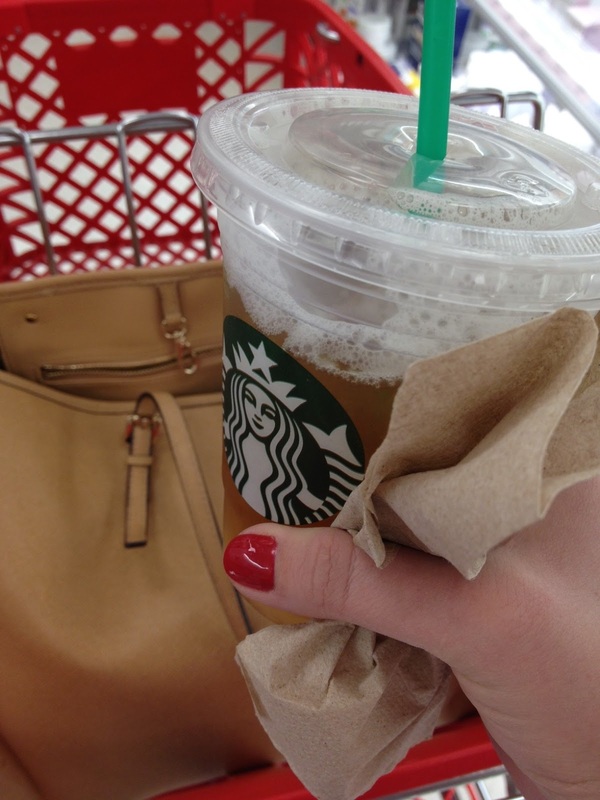 I had to focus, so an iced green tea was a good way to jump start the adventure. I did venture off course a few times, but it was a success and that drink was REALLY good! Speaking of drinks, here's what I saw on my coffee table yesterday afternoon. Yep. I'm that girl. 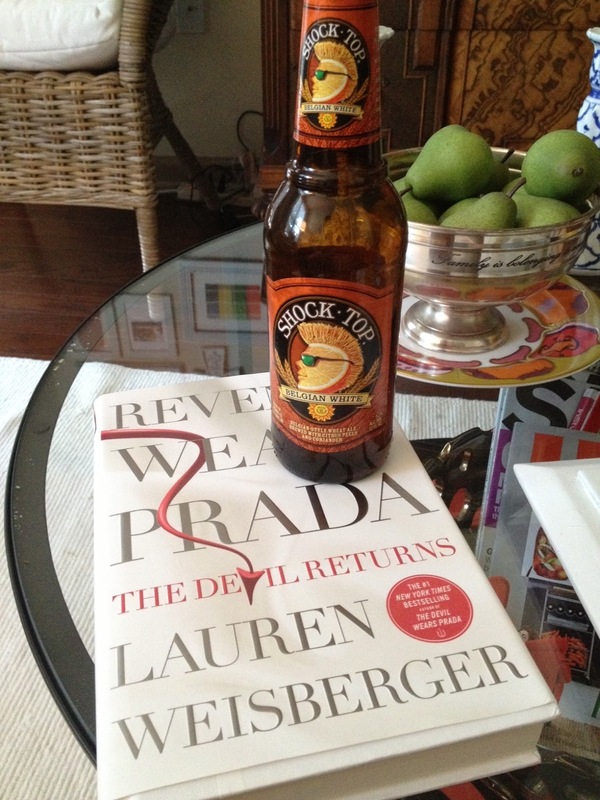 Reading the sequel to The Devil Wears Prada and drinking a Shock Top while doing it. VERY guilty indulgence right there (aka NOT paleo, if you're wondering). And yes, the book is actually very good. Not quite what I was expecting but I read about 250 pages in one sitting, so I would recommend it so far. And finally, I want to introduce you to my score of the weekend. I snagged SIX of these goblets for $12 total. TWELVE. I am in love, needless to say. Be sure to drop by for tomorrow's post. It is one that I'm REALLY excited about!